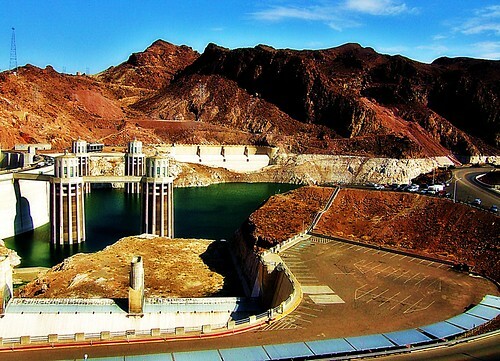 Hoover Dam, originally uploaded by wonderfunlife. Nieves took a picture of the stark scene facing the Lower Colorado River in early 2008. At the time, the lower part of Hoover Dam's spillway gates were over the water line, effectively disabling them from use; additionally, the low water level exposed parts of the penstocks that had not been exposed to the atmosphere in half a century. Well, things have only gotten worse since then. Today we reached a dubious milestone, with the water level of Lake Mead dropping to 1082.95 ft as of midnight, per the US Bureau of Reclamation. (N.B: This is a temporary link; The permanent link will be located here at the end of the month.) The importance of the 1083 ft level is that the last time the lake was this low, it was being filled for the first time, back in 1937. What does this mean for the civilization in this desert? I don't know. However, we can't really continue to deny that there are severe water issues that we need to deal with in the near future.